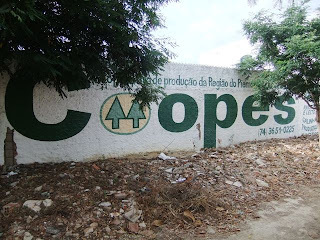 Without a doubt, my favorite aspect of the time I spent in Capim Grosso was getting to work from time to time at Coopes, a cooperative of about 150 farms in the region around CG, in interior Bahia. 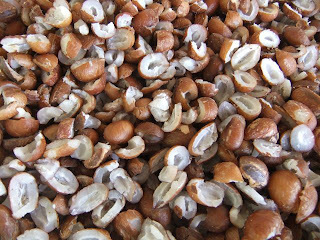 My primary activity there involved the processing of licuri (pronounced /li ku 'ri/). 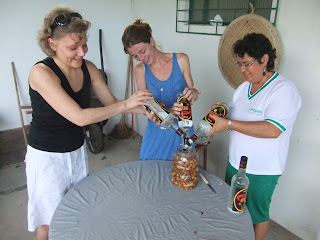 Processing, here, means anything from cutting raw licuri and removing bichinhos, to squeezing oil from toasted & blended licuri using a specially made machine, to adding pinga to a big bucket of the fruit to make liquor de licuri. In addition to finding the walk to Coopes away from The Association a welcome and relaxing activity, even when it was 35+ degrees outside, I found whatever potentially repetitive activity I might do for a couple of hours once arriving to be therapeutic. Moreover, the president of Coopes is an entertaining and delightful businesswoman. Oxalá I can and will somehow play a part in getting licuri introduced into the US in at least some of its forms: licuri flour, toasted licuri as a snack, licuri butter (cf peanut butter - YUM! 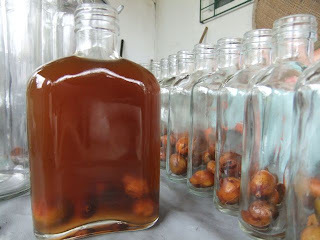 ), licuri liqueur, and licuri oil, of course! 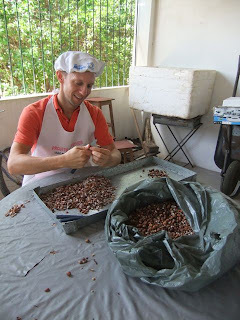 The uses and nutricional benefits are many.